Affordable Accoutrements: Tropicana Canna Table! When it’s time to set tables for Tablescape Thursdays with Susan of Between Naps on the Porch, I tend to go with something safe and familiar. Most of the china, crystal, silver, and table linens I’ve shown you so far fall into the elegant category. Pieces I’ve used are almost invariably vintage, purchased at thrift stores and estate sales. Some are eBay finds (usually to complete/supplement estate/thrift purchases). Today’s table represents a more casual approach to entertaining. It’s definitely colorful, festive, and fun (at least I hope it’s fun – you decide!). It’s a little bit tropical, and there are nautical touches. Pink flamingos, standing guard at opposite ends of the table, observe the proceedings. Do you think these birds mind that I used vintage Fostoria Colony (1940-73) stemware and candleholders? Is it too fancy for today’s table? Colony’s swirl pattern reminds me of the twisted fibers and strands of a rope. There’s rope edging on the American Atelier salad plates. The blue plates were new-in-the-box at Goodwill – on sale for half off. Bits of Christmas wrapping paper were still taped to the boxes. I hope the person who gave them as holiday gifts won’t see today’s post! The dinner plates are Pfaltzgraff Carrara (1992-95). The color reminds me of sand, and the price was right -- only $3 for all 8 at a local thrift shop. The stainless flatware is Oneida’s American Harmony (introduced in 1986). The milk glass bud vases hold Tropicana canna lily leaves and red-violet crepe myrtle blooms. The vases are thrifted as well – 4 for $1. The fifth was free at a different local thrift. The shop owner forgot to include it when she totaled my other purchases and said I could just have it. The burgundy candles, recycled from a previous table post, were after-Christmas bargains at Walgreen’s. For extra color, I put bright orange canna blooms and yellow roses (held by a vintage glass flower frog) in a Colony bowl. I also added a lime resting in a Colony “salt dip” and a lemon (in a yellow plastic lemon keeper – very practical for refrigerator storage!). Just for fun, I "tweaked" the image below to make it seem that the flamingo decided to have a sip of the wine. He'd been looking at it for hours, and I thought he might be getting thirsty! What do you think? Does it look like a table where lively, interesting conversations might take place? I hope so! 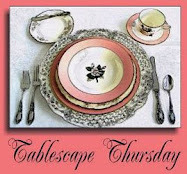 Please join Susan of Between Naps on the Porch for Tablescape Thursday. You’ll be glad you did! 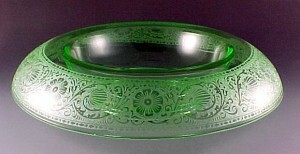 I'm also linking to Centerpiece Wednesday at Style Sisters. Check it out HERE. If you haven't seen my "I Want Magic" video yet, I hope you'll take a look HERE. It's courtesy of the talented Julio of Beaux Mondes Designs. If you haven't visited Julio lately, I hope you'll stop by. Thank you, Julio! beautiful and very romantic Bill! So beautiful and whimsical! I love the blue plates and how the swirl pattern in the crystal just seems to mimic the water to me! Great choice! Very pretty center piece too! What a fun table Bill! I can almost feel a tropical breeze and steel drums in the distance. Great end of summer table. What a beautiful table -- and even though it is "casual" to me it has that Bill Elegance of all of your tables. Love the centerpieces -- you take those very inexpensive white vases and turn them into something that looks spectacular! You are the Star of Tablescapers! Aha! A blue hour shot! I knew you'd sneak one in there. I love your table. I can just imagine all the ladies and gents in their finery, laughing and talking and clinking glasses in toasts to one another. It's quite festive and i would love to be part of this group. You just taught me how to take simple flowers and make them special. You got some great finds.. I dub you king of the scapes!! Bill, how you make simple so elegant is beyond me! Those flamingos are great...love how you have done the floral centerpiece(s). The candlelit tables are magical! Just gorgeous. It all works together beautifully (of course). The Flamingos are the best. This is a fun and beautiful table. I like the way you arranged the vases and candles! Love how you always come up with something different and unexpected! This is just as impressive as everything you do Bill! i love the tropical feel. The flamingo is the perfect touch!! I received your message about encouraging a friend but read it from my phone and now it has disappeared from my mail messages. Could you send me the info again? Thanks so much for sharing your beautiful creativity with us! It may be "casual" but it is still elegant. I like the whimsical touch of the flamingoes and the blue nautical salad plates. I love your tropical table. The glow on the candles is so pretty. Very nice flower arrangements too. Wonderful table setting! !Your accessories are so pretty,the dishes are special! This is going to go into my favorite "Bill Table" file! I love the casual elegance. A gorgeous table. I've moved Back Porch Musings to Typepad. Long story! I threw together a quick blog over there, so I can notify people of my new addy. I will work on the appearance when I have time. Although my old URL doesn't work at the moment and maybe never, I can get into my dashboard and my lists of blogs. I'm slowly making my rounds. It may take a few days. I have long lists! Hope to see you at typepad! Adore it! Fun, yet elegant. Oh, that's such fun! Everything looks terrific. Love the colors. I loved that you used various colors with the placemats and that pink flamingo said, "let's party!" Bill, you can take canna lilies,leaves,crate myrtle blossoms,nautical plates,light some candles add some flamingo's and I feel the salt air from some tropical island and the sand between my toes....THANKS,I needed this light-hearted setting.O' the song,"would you marry me Bill"...keeps singn' in my head,hehehe,just playn' with ya. That was a fun and beautiful table. I liked all the pictures both day and evening. The colors complemented each other so well. The table itself looked beautiful, I didn't see a table cloth. It's time for the pina coladas! I will be right over!! Any table with Flamingo's is one I would be happy to sit at, chat and drink a nice glass of wine. Love the colors and the centerpiece is fabulous. Bill great job as always. Bill, your floral arrangements never cease to amaze me! LOVE the striped canna lily leaves with the crepe myrtle -- so dramatic, yet fun! The tropical colors are so fresh and appealing! Very nice. I LOVE the pink flamingos and the Colony is a nice touch, not at all fancy. I do believe that you filled all those glasses with real wine and drank them before you set the table. This is so unexpected from you and so much fun! Of course I love the unexpected and I like anything that reminds me of Florida, so the flamingos make me smile. The way you lined the center of the table really makes a statement when the candles are lit...so pretty! I love it, every one needs to play with wild color sometimes! I am loving the bright colors and the very cool centerpiece! I love the idea of using large leaves mixed with a sprig of flowers. Please link up to centerpiece wed. All of your tablescapes are magnificent! Love your ideas. This is a beautiful tablescape, Bill. I really like the milk glass vases with the flowers and canna leaves. You got a great deal on your dinner and salad plates, and they look very nice on your table. Great table, Bill! Yes, I am pulling up a chair and enjoying the lively conversation! Oh this is fabulous. I really love the centerpiece treatment. I get such good ideas when I visit your scapes!! My first thought scrolling down was "oh yea, this is fun!". Lovin' the colors, and the shots as the sun goes down remind me of the final sunsets of summer. Enjoy! What a fun tablescape! Love the colors, and the nautical theme. And the flamingo....! Love your table! Definitely FUN. And sophisticated! Tres chic! Fun, interesting, AND wonderful! I totally grinned about the flamigo at the end. When the sun went down, it went from fun to pretty with all the candlelight. My favorite part of this table is the way you lined up the bud vases with the simple floral in each one down the center of the table. I LOVE that look and wouldn't have thought of it. It just *made* the table to me. Yes, I would love to sit at this gorgeous table and I am sure much conversation would be centered around the lovely tablescape. The canna leaves are absolutely fantastic. love the drama! great color contrast, love the blue plates too, great fun! Fun and colorful...and charming, as usual!! All of the colors go so well together and the centerpiece(s), so pretty and creative! So gorgeous, perfect for summer's end! Love the drinking flamingo, and I love that so many of these were thrifted! 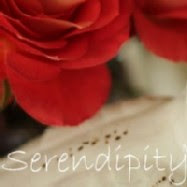 Fabulous blog, you are just my style, so happy to find you and happy to be your newest follower! You do casual beautifully! Flamingos and canna leaves say "cha-cha-cha" to me!!! Holy cow, Bill! The colors nearly knocked my socks off! What a fun post! This is definitely not a typical Bill tablescape, but I really enjoyed it. Loved the great blue plates you found at Goodwill. They certainly prove that one man's trash is another's treasure. I loved the beautiful large leaves and flowers in your centerpiece. They added such a striking touch of color to your table. Loved this fun and entertaining table! Love the flowers and greenery in the milk vases; such a clever idea lining up the vases, and boy, what an impact! I think your table is such a fine idea for showing how to take the everyday dishes and make them wonderful. So pretty, love the way you display the flowers and the leaves! Gorgeous, and I wish I had your skill with the camera. What kind of camera do you use? Be still my heart. Honestly, my heart leapt when the first photo came into view. I love colour and this is done beautifully. Thank you for sharing. I still can't believe the price you paid for those lovely milk vases :oP lol. Just as pretty as it can be. Love those flamingos..and I have had this room full of those bud vases and...where are they now that I want them?? I do love what you did with them, too. I love everything about this delightful and fun table. Regarding the boy that tore up ole Billy in my back yard. We aren't trying to be his savior...just knowing how young people can need a break sometimes. I have know others in my life that, when they drank too much, they got mean as a bull. I think he must be one of them. We've told him that we'd give him a chance to pay for things..and knowing how hard it is when you are in school and not working, we've just asked him to replace the kitchen window right away. He can replace my glass on the patio table when he has the money. He's already cleaned up all the glass and blood...and will be back by the weekend with the window glass. He is also buying a new fire pit for us. Oh Bill, I LOVE this tablescape!!! The flamingo, where on earth did you find such a retro piece? It reminds me of the classic 1950's beach theme. I adore that little flamingo very much. And I love what you did with the white milk glass vases. This screams fun, fun, fun...Then again, how could it not with a wine drinking flamingo? Bill, you are the most versatile of tablescapers! This table is so fun and yet has your trademark elegance. I especially love the row of vases and candles down the center of the table. BTW, I just love your table. It is gorgeous. As always, you are an inspiration! Thank you! Bill, this is a great table. I love the way the crystal shines! Just beautiful! The flamingo is cute too! I would love to be a part of your dinner conversation! Those white milk glass vases are the perfect contrast to the green leaves and purple flowers. What fun colors of tablewear and I love those pink goblets. Your pictures are as amazing as ever! Just incredible pictures Bill. wow. that is a gorgeous table you set. I love how the light changed in the room and as the sun set you lit the candles. Just gorgeous! Bill, you always inspire and amaze me with your gorgeous tablescapes, both formal and casual! This nautical/tropical inspired medley is really beautiful and made me feel like I was at a wonderful Hawaiian resort enjoying a meal with friends! I love those blue plates and what a find...I need a Goodwill! Great job as always! I know this setting is a little different than what you normally would do, which is pure elegance, but I love this casual look too. I love that it's whimsical and combines a mix of elements. The vases with your florals in the center are wonderful, and they look so great with the picture hanging on the wall. I love this setting! I bet it was fun for you to do something like this. You did an amazing job as you always do. Your photos are so nice too! Superb! Just love the blue plates. Its a lovely table full of vibrant colors & textures...love the rope like edges on those fantastic bargain plates! Lucky Dog!! How many times I have passed up purchasing white vases just like yours, thinking they weren't special enough. Lined up in multiples gives them a striking presence, especially with the tall Tropicana canna lily leaves & myrtle. Very creative! Thanks for stopping by to check on me. I seem to have run out of tablescapes for the moment but I'll be back to join the fun soon. Splendid table!!! I am totally in love with all of the fabulous decorative accoutrements, especially the flamingos! And the dishware all 'round is to die for! I'm blown away by it all!!! Hi Bill, I finally made it back! A nice surprise, I thought you were here in Florida with the tropical theme! I love the color combination! The flamingo sipping is sooo cute! I can't believe someone wouldn't want those dishes, and sent them to GW! Now I'm off to see the other post!